Organizations with digital-ready networks are realizing 2-3x the revenue growth of those that lack such a network. And companies digitally connecting their distributed enterprises have boosted their profit margins by 30–50%. With cloud becoming more of a factor in digital business transformation, many are now looking to wide area networks (WAN) and software-defined WAN (SD-WAN) to help connect their business. 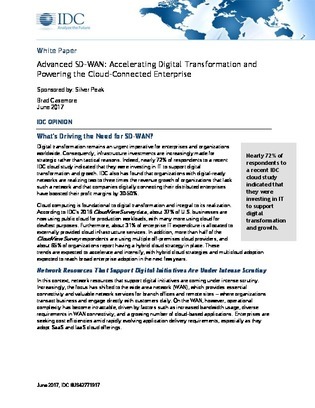 This IDC report discusses the current state of SD-WAN and why so many organizations are adopting it. Find out what benefits these organizations expect SD-WAN to deliver, several use cases, and more.